Who do we think we are, putting, for more than eight years into limbo, the German judicial process that seeks to prosecute allegations of bribery and corruption involving the administration of former German chancellor Helmut Kohl? Schreiber faces no charges in Canada and neither does Mulroney. The only serious matter these two face in this country, is nebulous speculation and partisan interest from the Liberal Party and the Fifth Estate. Given that Schreiber charmed, offered a hypothetical bribe to a Bloc committee member yesterday, the former arms dealer seems not to show any regard for the serious charges that he faces in Germany. Supplementary: And since when did the Liberals start favouring the idea of Parliamentary supremacy over that of the courts? Today, I was able to make the House of Commons committee on Access to Information, Privacy and Ethics at Parliament. Here are my notes about what happened. – Schreiber arrived in committee escorted by the RCMP. During the closing minutes of the committee he was flanked by four suited ear-pieced Mounties. Outside, on Parliament, police cruisers were on standby. Schreiber insisted that he be allowed to appear in committee in plain clothes instead of an orange prison, the police presence quickly reminded people about the serious allegations surrounding Schreiber. – The last item during committee was a debate concerning whether or not Schreiber would be held in an Ottawa detention centre or in his private estate under house arrest in Ottawa. One Liberal committee member expressed that he wanted to ensure Mr. Schreiber got a good night sleep so that he’s able to testify. 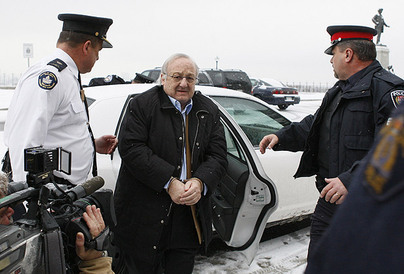 Prior to the committee, Schreiber was escorted to Parliament Hill by police in handcuffs. – Main sticking point of the committee is Schreiber’s “inability” to testify because he hasn’t had access to his notes and that the German-Canadian businessman wouldn’t be able to recall specific details. One Conservative member complained that Schreiber was able to write an 80+ page affidavit and that Schreiber has had about 8 years to recall the details of his dealings with former Prime Minister Brian Mulroney. – At first, Schreiber read from a hastily scribbled note that he struggled to read that he would not testify until given access to his notes which are located in Ottawa, Toronto and Switzerland. The last locale elicit laughter from those in attendance as it almost seemed like wishful thinking that Schreiber would be able to travel outside of Canadian (or German) jurisdiction to access his notes. – Later, after being told to defer on answers from which he would need his notes, Schreiber eventually answered in the definitive to earlier questions on which he was unclear. This inconsistency seemed to wash over those in attendance as if they came to expect dodging from this star witness. – I counted five CBC/SRC journalists in attendance and four of them were front-row-centre. The involvement of the state-funded broadcaster may come under more intense scrutiny when Dr. Johnston delivers his terms of reference. If Mulroney, who himself has called for a full inquiry, gets his way, the CBC – particularly the Fifth Estate – will be called before the inquiry to answer for what he has termed a vindicate character assassination campaign. – Headlines, if any, will include the new information that Schreiber arranged $500,000 for Mulroney’s services, however, he only paid $300,000 because he was unsatisfied with Mulroney’s work. – Every reporter that I’ve spoken to about this have a feeling that Harper’s office is not directly tied to the Mulroney-Schreiber affair and of course, implying such a connection is the strategy of the Liberal party. One reporter remarked that the meeting was the biggest press circus that he’s ever seen for a committee witness. – With respect to the delaying tactics of Schreiber, both he and the Liberals can easily serve each other’s agenda. Schreiber seeks to delay extradition to Germany to face bribery charges, while the Liberals don’t mind stretching the process out over weeks and even months. The Liberal chair was quite accommodating to Schreiber’s dilemma of not being prepared to testify. Schreiber will continue to appear before committee meting out small portions of his story until the committee is satisfied with his testimony. Conservatives are receptive to full testimony by Schreiber, but want the man to get on with it and wrap up as soon as possible. The Liberals aim to tar Mulroney and the Conservative Party with the same brush as they have inquired into past donations to the PC Party by Schreiber. Elizabeth Thompson reports this morning that the Liberals were also recipients collecting $10,000 in donations from the former arms dealer. The Conservatives made an effect to insulate their party from Schreiber as they point out that he has not donated to the Conservative Party of Canada. You know that there’s something wrong with your line of thinking when you tread in territory where even the Canadian Federation of Students won’t go. The radical left wing activists at the Ryerson Student Union (RSU) were to table a motion at the annual congress of the Canadian Federation of Students (CFS), which the CFS voted to not even consider. 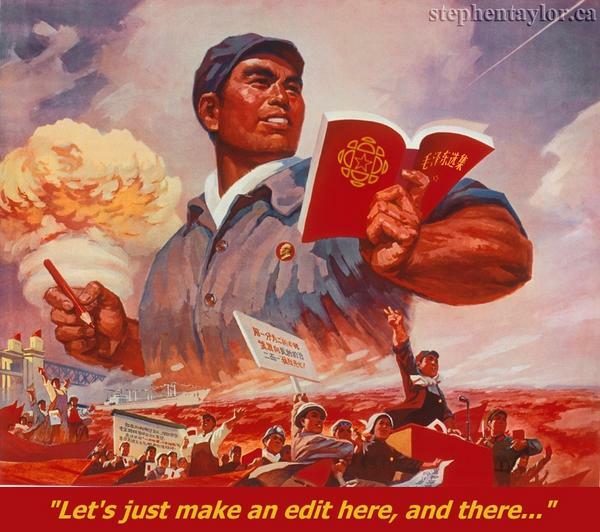 That, of course, won’t stop the RSU from their mission. Ted Rogers School of Management, Rm 1-067 (1st Floor) 575 Bay Street @ Dundas “Student-led university academic boycott movements were deployed trans-nationally in resistance to South African apartheid. Today, in response to a statement against academic boycotts, issued by President Sheldon Levy, the debate continues in the contemporary context about the Middle east. This forum will explore the role of academic boycotts as a tool of resistance and their relationship to academic freedom. This is a historic debate, seating will be limited, come early. According to the student representatives at Ryerson, Israel is an apartheid state, much like South Africa used to be. Heather Kere, vice-president education of the Ryerson Students’ Union, is calling on the Canadian Federation of Students – Canada’s largest student lobby group – to “research the feasibility of a boycott, divestment and sanctions campaign” against the “Apartheid State” of Israel. Given this, a discussion/debate will be had as to the effectiveness of academic boycotts as a tool against Israel. The premise, according to this group, is clear: Israel is an “apartheid state”. The finer points of a solution are what is under consideration. Is CBC an impartial news organization when it comes to reporting on Middle-Eastern affairs? How it labels terrorism? News anchors should not endorse political views (and Meharchand is by validating a debate based on a premise that is itself debatable (if not absurd), but is instead accepted as fact by the RSU and as the basis of subsequent debates, including this one!). News anchors aren’t even allowed to endorse toothpaste, why is Meharchand endorsing a debate involving these radical views? Is there something wrong with the corporate and philosophical culture at CBC that this sort of thing is considered acceptable? 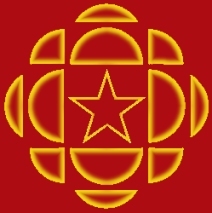 As a Canadian, you are a stakeholder of the CBC. Is this what you’ve come to expect from representatives of an organization that claims to represent you? UPDATE: It’s worse. Not at all apparent from the event’s press release on the RSU website, is that the “debate” on academic boycott as a tool for “resistance” is co-sponsored by the Ryerson Faculty Association and the University itself. I fear that these groups, and the involvement of a reporter from CBC will add an air of legitimacy to a discussion which would be deemed indefensible outside of the loopy arena of student politics. York University saw the worst antisemitic display ever on that campus last week, said Ben Feferman, senior campus coordinator for the Canadian region of Hasbara Fellowships, an Israel advocacy organization spearheaded by Aish Hatorah. The Betar-supported Campus Coalition of Zionists (CCZ), together with Hasbarah, manned a table in Vari Hall, with permission from the university, with pamphlets and brochures about the danger emanating from Iran. However, the situation became very difficult for the students who participated. They were vastly outnumbered by pro-Arab students who surrounded them, and eventually the pro-Israel activists fled. As they left, there was cheering by the pro-Arab mob. In fact, Feferman noticed an acquaintance there and said hello, but received no acknowledgement. She emailed him later that day to apologize, explaining that she didn’t want everyone to know she was Jewish. To Feferman, this episode is a red light. “We know there’s a crisis when a student on campus is afraid to reveal she’s Jewish and feels unsafe,” he said. The RSU is free to publish their positions labeling Israel as an “apartheid state”, but we are also free to condemn their position. When the Faculty Association, the University and a CBC reporter get involved to foster debate on the issue, they are legitimizing the RSU’s indefensible position. By labeling Israel as an apartheid state, in effect, the RSU is arguing that Israel is illegitimate under international law. Contrast this with the academic freedom afforded to those that defend Israel’s right to exist and the rights of activists that wish to educate people that anti-semitism is still a problem. OTTAWA – Today, Member of Parliament Wajid Khan announced he is stepping aside from Conservative caucus. The decision was made following media reports that he may be charged under the Elections Act over matters dating back to the 2004 election, when he ran as a candidate for the Liberal Party. TORONTO, November 20, 2007 � B’nai Brith Canada has voiced its strong opposition to an anti-Israel motion calling for “boycott, divestment and sanctions” that is expected to be introduced by Ryerson University students at tomorrow’s meeting of the Canadian Federation of Students. “The very flawed notion that Israel is an apartheid state is an assault on history and truth,” said Frank Dimant, Executive Vice President of B’nai Brith Canada. “The fact that this motion is proceeding in the name of the Ryerson Students’ Union when it was neither put to a vote, nor backed by the student body, is a further affront to due process in order to advance a vehemently anti-Israel agenda. Late last night, the Canadian Federation of Students voted to reject consideration of the motion. This comes as welcome news. The motion to reject consideration of the anti-Israel motion was endorsed by two-thirds of the voting plenary. In September of this year, I wrote about the rejection of my Alma Mater of similarly absurd calls to boycott Israel proposed by the Britain’s University and College Union. It appears that there will only be one jolly bearded man in a suit spreading cheer to the little ones in this year’s Milton Santa Claus Parade. That is, there will only be one that was invited. My hometown’s local newspaper (full disclosure: years ago I was once a paperboy for the outfit), had the following story about Halton MP Garth Turner and the latest controversy he’s involved in. Turner, Halton’s controversial [Liberal] MP, was told that there’s not enough room for him, for PC MPP Ted Chudleigh or for Regional Chair Gary Carr. Garth’s planned crashing of Milton’s Santa Claus parade will ruin the credibility of parade organizers with the other politicians that they’ve turned down, according to Ricker. Isn’t this supposed to be for the children? Milton – The office staff of Hon. Garth Turner, P.C., MP for Halton will be serving up hot apple cider and holiday greetings from their constituency office along the Milton Santa Parade route. “Many businesses and services along Main Street have an Open House tradition where they invite family and friends to drop by during the parade. My office, thinks this would be a great way to celebrate the launch of the holiday season.” said Turner. Parade watchers young and old are invited to drop by Garth Turner’s Help Centre at 86 Main Street East from 2:00 to 3:00 pm on Sunday, November 25th to warm up with a cup of cider. Frank McKenna is in Ottawa today for an informal and intimate dinner at a small Centretown restaurant. He’ll be meeting with political staffers from all four parties, journalists, civil servants, lobbyists and intellectuals, all of which are Atlantic Canadians. Given SES’s recent poll showing Dion’s Prime Ministerial potential at rock bottom, is McKenna in the first stages of testing the waters for a future bid at Liberal leadership? The former New Brunswick Premier was smart to sit out for the last contest. But would McKenna steamroll Rae and Ignatieff in the next race? Insiders say that McKenna would be a strong contender for the Liberal Party if he should ever become leader, however, it has also been said that the former Canadian ambassador to the US would rather be the clear favourite in such a race rather than getting down into the mud to slug it out with others that aspire to lead Trudeau’s party. I made this picture in response to CBC’s unfortunate capitulation to China’s censorship demands over its editorial and news content.